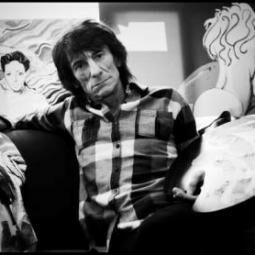 Born in Middlesex in 1947, Ronnie grew up surrounded by creativity. Ronnie quickly began painting and sketching as a little boy and eventually went to study at Ealing College of Art.Over time he developed a love for the masters, taking inspiration from the likes of Picasso, Egon Scheile and Van Gough. As he flew to stardom in legendary band, The Rolling Stones, Ronnies continued to create artwork; his subjects being anything from musicians he admired to known loved ones, and of course, self portraits. His artwork is now a homage to his two true loves - art and music - creating work reflecting his time with the Stones alongside an appreciation of the musical masters.